Sydney’s older brother, Peyton, has always been the star of the family. Even after he gets into an accident, leaves a young boy paralysed, and gets himself arrested, Peyton is all her parents can talk about. Sydney feels adrift in her family and insists on switching schools, in hopes of finding a new place for herself, away from all the accusatory stares her and her family get. She misses being invisible and longs to go back to it. At her new school she meets Layla and Mac, siblings who seem normal compared to her family. She begins to spend time with them in hopes of escaping her own problems. Opening a new Sarah Dessen novel is like opening a box of chocolate. You know what you’re going to get, but you’re still so excited! If you’ve read Dessen’s previous works, you know she has a formula. And it’s one that works well. Hey, if it ain’t broke, don’t fix it. Opening one of her books (even a new one) is like pulling up a chair and having a nice long chat with a good friend. It just feels so good. This book came out earlier this year, but I didn’t have a chance to read it till now. I devoured it in less than a day. There’s a common assumption that Dessen’s books are all summer books, but that’s not true. Many of them, but not all. And this is one of the few that takes place over the school year, although it’s hard to tell around what time. Unlike other Dessen novels, there isn’t much mention of major holidays or jackets or warm or cool weather or the end of the school year, which felt very odd, now that I think back. Something else that was different about this novel, compared to other’s, was the lack of boy involvement. Usually Dessen’s boys are as complicated as her heroines, and appear almost at the story’s beginning. But Mac made a brief appearance in the beginning, and then disappeared until about halfway through the story. Instead the story focused on Sydney and her guilt over her brother’s accident, as well as her blossoming friendship with Layla. It was definitely a refreshing change. A character who gave me the creeps was Ames, Peyton’s friend, who became a fixture at Sydney’s house immediately after her brother’s arrest. He pretty much tries to become Peyton’s replacement, which Sydney’s parents welcome whole-heartedly. They discuss Peyton with him, and invite him over often, especially when they’re gone on overnight trips. Sydney can’t stand him but her parents don’t sense this and continue to have him keep her company when they’re not around. Every single time he was in a scene, I was on hyper alert because I had a feeling he would do something to Sydney, so it’s not a surprise when he does. The ending was a bit anti-climactic and felt rushed. All the tension between Sydney and her mom, which has been mounting throughout the book, sort of just deflates. There’s no big confrontation or even conversation. We just hear about it offhandedly and it’s disappointing. Overall, I enjoyed the book, especially the differences between Dessen’s other books and this one. But the ending left me wanting more; I especially missed Dessen’s poignancy at ending her stories, especially as she brings everything to full circle. This entry was posted in Book Reviews and tagged book reviews, four stars, YA. 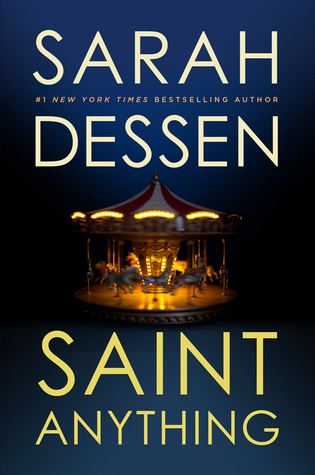 I’ll be honest…I’ve only ever read two Sarah Dessen books and this one was the 2nd! I really liked it though! I listened to it as an audiobook and the narrator did a great job of bringing the characters to life (especially slimy creepy Ames!). I agree with the ending feeling rushed though. I wish it had been fleshed out a bit more, but overall it was an entertaining story!